In the four years since the Institute of Medicine (IOM) released Primary Care and Public Health: Exploring Integration to Improve Population Health, there has been an increasingly urgent conversation about the need for improved collaboration between health care and public health. At the de Beaumont Foundation, I have worked to advance the IOM’s recommendations through initiatives like The Practical Playbook and The BUILD Health Challenge, but there are many others like HICCup’s Way to Wellville and Institute for Healthcare Improvement’s 100 Million Healthier Lives. As a kid, I used to watch G.I. Joe. Every episode concluded with a G.I. Joe character saying, “Knowing Is Half the Battle.” What I didn’t realize at the time was that G.I. Joe was teaching me a lesson that would stick with me throughout my professional career — the difference between knowing and doing. Just knowing is not enough. So what can people in public health and health care do? Over the past eight months, I have been on a listening tour (both online and in person) to find out what is working throughout the country and what’s not. Are you ready to move from knowing to doing? Here are some lessons I’ve learned from leaders in public health and health care. 1. Develop and educate the workforce. Whether it’s in medicine or public health, we have to educate the workforce about potential improvements that can be achieved through collaboration between these sectors. In a Twitter chat hosted by the Healthcare Leader Blog on collaboration between public health and health care, I learned that those working in health care often don’t know what public health does or has to offer. Helping our health care colleagues understand what state and local health departments can offer is important to start collaboration. In Virginia, for example, former State Health Official Dr. Karen Remley regularly shared updates on disease trends with the provider community. In Georgia, the EPIC (Educating Physicians In their Communities) program sent teams of trained professionals to physicians’ offices to teach them about important public health efforts in support of breastfeeding and immunization. 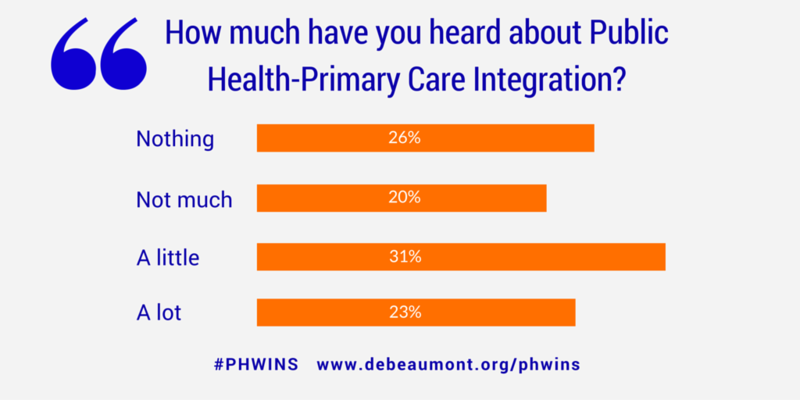 Only about half of the state public health agency workforce had heard about public health and primary care integration. Among those who had heard about it, 91 percent thought it was an important topic, and 52 percent wanted more emphasis on integration. These data, from the Public Health Workforce Interests and Need Survey (PH WINS), demonstrate that there is a demand among the public health workforce for more information on how to partner with health care. Given this demand, governmental public health leaders should be encouraged to talk with their staff about ways to improve collaboration. We will have achieved success when all public health planning considers potential partnerships and leverage points for clinical medicine. While there’s lots of conversation around the need for collaboration between public health and health care, there’s more to do to get health care leaders and public health officials actually talking. It continues to surprise me that many in health care don’t know who their local public health officials are. Public health may know the hospitals within their jurisdictions but often don’t have the personal relationships with their leaders. We need to find opportunities for public health and health care to talk, share experiences, and learn about each other’s pain points. Public health leaders can leverage their unique position inside government to create these opportunities through convenings and summits. Use the influence of the mayor or governor or the health official to bring health care leaders together with public health officials to start a conversation about improved partnership. We can jump-start these conversations with practical examples of health care and public health working together and how the relationship has benefited each side. If every health department nationwide did just one such convening, we would start a national conversation with the potential for significant change. Whether in public health or health care, we need to communicate our successes more effectively. Sharing success stories from around the country where collaboration works, as we do in The Practical Playbook, is a great start. 3. Capitalize on Opportunities to Work Together. “Finding opportunities to work together” sounds like a vague admonition — until it’s applied. In January, the Philadelphia Inquirer reported that kidney stones are becoming increasingly common among children in Philadelphia. This incredibly painful disease, usually found in middle-aged white men, is most likely caused by low water intake. This is the perfect opportunity for public health and health care to work together. Today, the Children’s Hospital of Philadelphia is working with the water department, the public health department, and Philadelphia schools to make clean water access a reality for all children in the city. This kidney stone cluster wouldn’t have been solved by the medical provider alone. Cross-sector partners were needed to address a community-level cause. Examples like this are everywhere. If you’re on the lookout, you can leverage them as an opportunity to create new partnerships with a lasting potential for change. 4. Close the Data Divide. A movie like Moneyball might make you think that data crunching is everywhere. If statisticians can come up with a way to win the World Series, they can definitely find a way to improve our health, right? Wrong. Despite all that we hear about “big data” and “analytics,” both public health and health care face significant data challenges. Public health professionals often find it difficult, if not impossible, to access timely, local disease and risk data, especially for chronic diseases like obesity, diabetes, and asthma. The relatively recent expansion of electronic health records as well as the emergence of other sources for digital health information has increased the availability of health care data and presented new opportunities for large-scale analysis. These developments have the potential to make the work of public health more effective, but we are still catching up when it comes to unlocking the right mix of privacy controls and technology. Health care providers have an unimaginable amount of personal health information — from blood tests and imaging scans to nutrition diaries, disease screens, and more. However, while individual data are deep, access to community health information that can provide vital context to an individual’s opportunities to be health is almost nonexistent. Crime rates, foreclosures, places for free and safe exercise, pharmacy locations, and other such information could be critical when providing health counseling and could be included in the electronic medical record (EMR). In the District of Columbia, a local physician remedied the problem of shallow community health information by integrating a database of local parks into his hospital’s electronic medical record system. As a result, when providers want to recommend exercise to patients, they are able to give useful, location-specific examples of where they might go and how to get there. Change is never easy — but this is the time to take action. We spend too much on health care and get too little in return. The nature of disease in America has undergone a tremendous paradigm shift from acute to chronic illnesses. Last but not least, political and regulatory changes have already forced the tectonic plates to start shifting below the health care system’s feet. Public health and primary care have been working in their silos for a very long time. Moving towards this model of primary care and public health collaboration represents a massive social transition from an ineffective but known past to an unknown, but hopefully healthier, future. Are you a leader of tomorrow — someone willing to take a risk and be a health care disruptor? I hope so. It’s going to take more than knowing to make a change… it’s going to take a lot of doing.